The collection of photographs in the UT Crossroads Chapter galleries includes both modern and historical images. They have been chosen to inform the eye and mind about historic trails and trails-related activities for all those interested in our region's overland routes. You can expect this gallery to grow with new exhibitions of both casual modern photographs and significant historical photographs. Check back often to see the latest views from the trails. We invite contributions to our collection. For further information or if you have pictures that you would like to share here, please contact us through our online form. The collection consists of many photographs brought together into several exhibitions on separate themes. Select from the list of blue links below to learn more about the photos in the collections, including, photographer, location, and history. 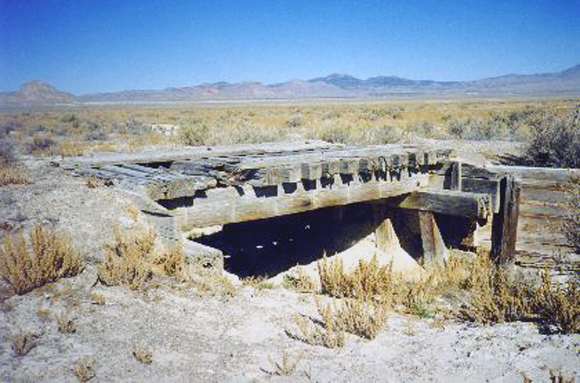 Wooden trestles along the trail - about ten miles east of Lucin, UT. Hastings Cut-off Trail - Granite Marker. VIRTUAL TOUR of the trail. This exhibition of 30 photographs is a companion piece to a home page on the Hastings Trail by Roy D. Tea, accessible in our Members' Pages section. Includes historical photographs. This 100-mile section of the Hastings Trail began with excellent water and forage but before delivering exhausted and suffering humans and animals at Donner Spring at the base of Pilot Peak it crossed 80 miles of water-less desert, much of it a vast salt mud flat devoid of life. 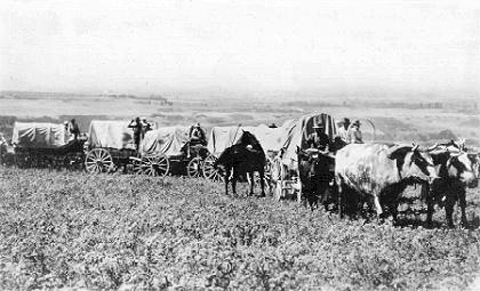 The trail often claimed stock, property and wagons from the pioneers who toiled across it. We have added an interesting gallery of pictures depicting some of the chapter's trail marking activities. Our chapter has an ongoing commitment to mark the historic trails that crisscross the state. At the present time we are placing strong, lasting markers made from railroad rails with stainless steel plaques attached that offer a brief description of the trail at that point, along the entire route of the Hastings Cutoff. 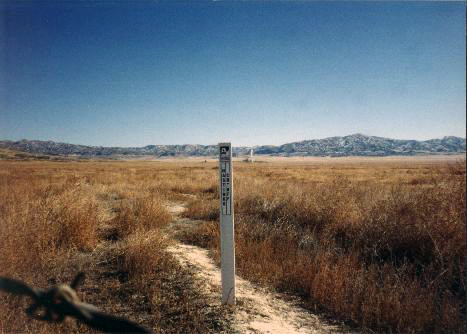 Marking trails involves in-town preparatory work such as painting the markers and riveting on the plaques as well as hours in the field locating the trail and digging holes, making concrete and setting the markers in place. All this effort is fun and rewarding and a great way to make and renew friendships. We usually mark trails on Saturdays. Contact us through our Online Form if you are interested. Disclaimer: The photographs in this gallery are from multiple sources. None may be used without prior permission of the copyright owners or in the case of most of the historical photographs, the owners of the physical images. Utah Crossroads is not able to grant permission for use beyond this website of the historical photographs. Please do not ask.Many photographs have been made available by members of Utah Crossroads for your enjoyment. With prior permission, some can be used for an appropriate non-commercial purpose where specific attribution to the copyright holder (photographer) and Utah Crossroads are displayed in conjunction with the photographs.